Champville stormed past Atlas in the opener. Champville shot 63.8 percent from the field and made 20-of-24 free shots (83.3 percent) during the game. Champville outrebounded Atlas F. 47-26 including a 41-18 advantage in defensive rebounds. They shot the lights out from three sinking 19 long-distance shots on high 59.4 percentage. Champville looked well-organized offensively handing out 38 assists comparing to just 14 passes made by Atlas F.'s players. 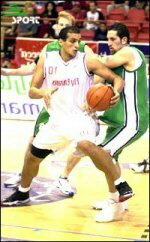 The former international forward Fadi El-Khatib (198-79) nailed a double-double by scoring 28 points and 12 assists (made all of his seven free throws) for the winning side and American forward Dewayne Jackson (203-90, college: Morgan St., agency: Higher Vision Sports) accounted for 30 points and 9 rebounds (on 10-of-13 shooting from the field). Champville's coach Fuad Abou Chakra felt very confident that he used 10 players which allowed the starters a little rest for the next games. American point guard Corey Spence (175-92, college: N.Colorado, agency: Mansfield and Associates) came up with 22 points and 4 assists and Spanish-Dominican Orlando Sanchez (206-88, college: St.John's) added 13 points and 5 assists respectively for Atlas F. in the defeat. Both teams had four players each who scored in double figures. Moutahed upset Beirut Club to take the lead. Worth to mention a great performance of American point guard Marvelle Harris (196-93, college: Fresno St., agency: Slash Sports) who helped to win the game recording 24 points and 5 rebounds. His fellow American import guard Isaiah Sykes (198-91, college: Cent Florida) contributed with a double-double by scoring 11 points and 11 rebounds for the winners. American guard Quincy Douby (190-84, college: Rutgers) answered with 19 points, 5 rebounds and 4 assists and the former international forward Ali Haidar (201-90, college: Michigan Tech) added 14 points and 10 rebounds in the effort for Beirut Club. Four Beirut Club players scored in double figures. Beirut Club's coach Patrick Saba rotated ten players in this game, but that didn't help. Homenetmen held off Hoops in Game 1. Homentmen players were unselfish on offense dishing 21 assists. U.S. Virgin Islands-Puerto Rican point guard Walter Hodge (183-86, college: Florida) stepped up with a double-double by scoring 29 points, 5 rebounds and 11 assists for the winners and Nigerian-American guard Michael Efevberha (193-84, college: CS Northridge, agency: Octagon Europe) chipped in 20 points, 5 assists and 5 steals. At the losing side Ali Mansour (-98) responded with 16 points, 5 rebounds and 7 assists and American point guard Willie Warren (193-89, college: Oklahoma) scored 19 points and 6 rebounds. 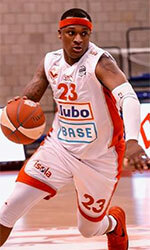 Five Hoops Club players scored in double figures. Al Riyadi defeated Byblos to secure the opening victory in the series. American forward Justin Brownlee (197-88, college: St.John's) nailed 19 points, 6 rebounds and 4 assists (on 8-of-10 shooting from the field) for the winning side and his fellow American import Dominique Johnson (192-87, college: Azusa Pacific, agency: Higher Vision Sports) accounted for 20 points and 4 assists. Brownlee is a former Eurobasket Summer League player, which is considered top international summer league in the market. American forward Aaron Nelson (205-91, college: S.Indiana) came up with a double-double by scoring 24 points and 11 rebounds and swingman Mark Khoury (196-98) added 17 points and 8 rebounds respectively for Byblos in the defeat.